The painting was framed by professional framer, Gary Coulthurst, and was delivered to the artist on Saturday 7th September 2013. 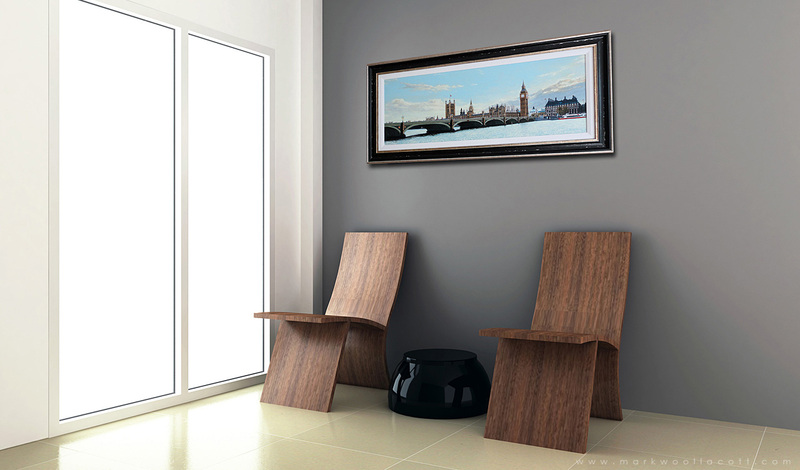 This frame has been hand-made and painted using traditional techniques. 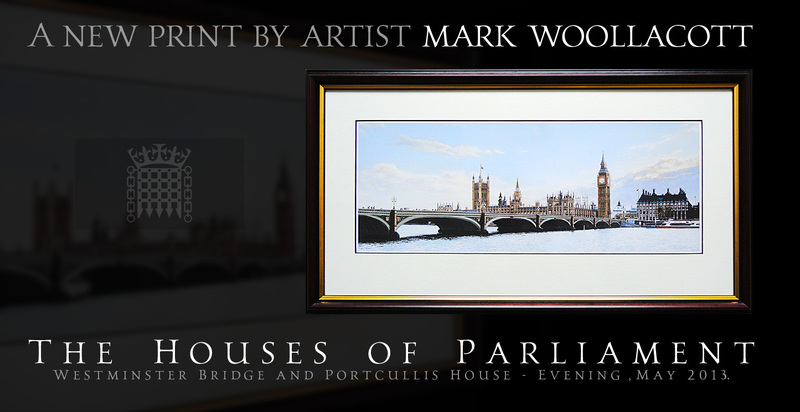 This framed print is on display at the MP for North Devon's office at the Houses of Parliament. This painting is based on a reference photograph which I took on Thursday 16th May 2013. An hour before I took this photograph, the sky had been filled with grey cloud and the scene had been quite overcast; but by 7:00 p.m. the cloud had begun to break up and to disperse in places, revealing a beautiful evening sky filled with a soft warm light. I took the photo a short distance from the London Eye, looking toward Westminster Bridge and the Houses of Parliament — with Westminster Abbey and the Methodist Central Hall behind, and Portcullis House to the right of Parliament. On 17th May, 2013, I was granted special permission from David Prior and the team at the Parliamentary Archives to visit the Victoria Tower, Houses of Parliament, to take a number of reference photographs from the eighth floor, and was shown a selection of the artwork on display at the Victoria Tower. I was also shown around St. Stephen's Hall and Westminster Hall.